SKU: sjs16. Category: Canvas Print. 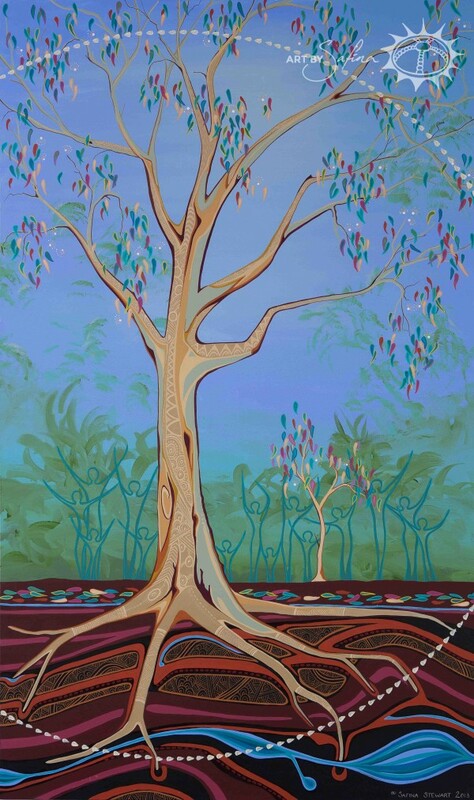 The tree of life and knowledge is a metaphor for the way the Council’s Indigenous Advisory Committee interprets our Indigenous community’s place in Yarra Ranges. It is through the metaphor of our tree that we bring together Western and Indigenous Ways of Knowing in contemporary, urban society. It connects our past, present and future. The tree represents our whole community. It illustrates how we are all one community, all connected to each other, to our environment and to the land. In recognition of the Country our community lives on, our tree is a Manna Gum. The Manna Gum is an important Wurundjeri symbol and our tree acknowledges and respects the traditional people of this land. The Manna Gum is also a tree that endures. Our tree grows in this land of the Wurundjeri people. The land is the mother of life. The roots of our tree incorporate the core cultural elements of: family and kinship, spirituality, language, land and country, art and cultural practice. These are the elements that support the tree and flow up from the ground as our cultural life-blood through the tree to its very tips. The main part of the tree trunk is our Indigenous Ways of Knowing. The second part of the tree trunk represents Cultural Strengthening and Cultural Heritage. This refers to the role that cultural development has in the continuation of a strong Aboriginal community. Heritage refers to Council’s role in the protection and preservation of cultural heritage values through planning and development processes. Health, Healing and Spirit refers to our sense of being in this time and space. The physical health of our Indigenous community is less than that of our non-Indigenous brothers and sisters. Healing the wounds of the past enables our community to look forward to a positive future. Healing also needs to happen within our Aboriginal community as it redefines identity through strong cultural connections in this diverse contemporary urban environment. Spirit refers to the strong connections to the earth, water, sky and community. Spirit also connects us to the seen and unseen spirits of ancestors, totems and creator spirits, the spirit of the plants and trees, to the animals, water and the rocks, to everything that exists. The smaller branches of Participation and Access are representative of Council’s way of knowing. Access and Participation are the entry points through which Council can assist in ‘Closing the Gap’. The leaves are a representation of our community, our people and the different coloured leaves reflect the diversity within our community. As leaves die they fall to the ground providing nutrients to the tree aiding renewal and sustainability. Our tree also provides connection back to more traditional times, to when our ancestors walked the earth. They are now spirits providing guidance to us today. This also represents the cycle of life across the ages. Our Manna Gum is always in flower signifying the beauty of nature and a harmonious existence that is part of. The flowers produce seeds that create new trees and so the ancient lineage of our life cycle continues. The sun as the giver of life shines on our leaves, on our community. Our community photosynthesises this sunlight into an energy that inspires vibrancy and vitality. This eternal energy source is the same that shone on our elders across time and unites the past and the present as one timeless space.